Work on this subject had begun in 1898. Crowe’s half-sister Eyrielle Crowe obtained permission to sketch the ‘Talleyrand room’ in the Rue St Florentin in Paris and sent Crowe a packet of drawings which arrived in January 1899. Crowe worked hard on the picture in the early part of 1899, hoping to send it to the Royal Academy that year. His friend H.A. Bowler, Professor of Perspective at the Royal Academy, worked on the lines of the octagonal room, which proved too tricky for Crowe, in February 1899, but Crowe was forced to abandon the picture as too unfinished in April. He began work on it again in late 1901 or early 1902. This painting was one of those remaining in Eyre Crowe’s possession at his death, and was sold for £14 14s at an auction of his remaining works at Christie’s in London on 18 March 1911. 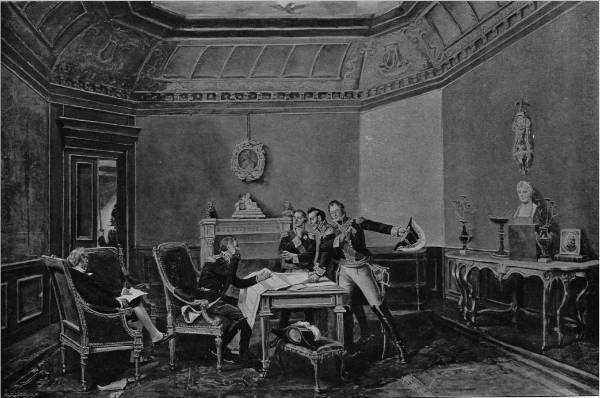 ‘Napoleon’s Abdication’ … is we should think about the worst Napoleon picture ever painted; there is not even the slightest suggestion of Napoleon in the figure, which, according to the subject of the picture, must be intended for him: it might be labelled ‘Puzzle: To find Napoleon. This, according to Crowe, was ‘sound criticism!’, but also ignorance, as ‘the description in the Catalogue re-iterates what most readers know, that Napoleon never left Fontainebleau but was represented by his Marshals on this occasion’.